If you are processing invoices, statements, letters and etc and you need to spend laborious hours of folding, inserting and sealing envelopes by hand, then it's time for you to change to computerised envelope. Computerised mailing is designed to handle your mailing operations in one easy step. 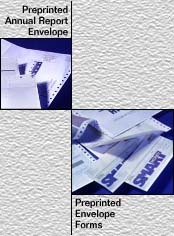 The computerised envelope consists of 3-ply forms. First copy is for your record, second and third copies are glued together. Every mailer envelope is securely sealed so there's absolutely no fear of gaping mailers, ensuring confidentiality. Security mailer is instantly ready for the post office, thus no fret, no mess. This reliable all in one process leaves your work area clean, dry and glue-free, free your staff from such mundane tasks, steamline your operations, and the solution to high labour costs, time and scarce resources. In addition, it improves efficiency and productivity and have well-designed appearance on the envelope.